Back in March, 20th Century Fox shut down production on The Maze Runner: The Death Cure, the third and final installment of the studio's young adult franchise, after star Dylan O'Brien suffered a severe accident on the set during a stunt that went wrong. Very few official details have been released since then, but in April, the studio halted production indefinitely, while giving it a new release date of January 12, 2018 back in May. Today we have a new report which claims filming will start in February 2017. Ironically, the movie was originally slated for release on February 17, 2017, before the horrific accident took place, and now it seems that filming may resume on or around that date. Deadline reports that filming was supposed to resume on May 9, but that was postponed, along with the release date, to give Dylan O'Brien more time to heal. As of now, Maze Runner: The Death Cure is slated to go up against Sony's Bad Boys For Life and Paramount's Sherlock Gnomes, a follow-up to Gnomeo & Juliet. The site reports that the set injury happened when Dylan was supposed to fall off a set that was made to resemble the back of a train. The actor is said to have fractured either his cheekbone or his orbital socket, but the studio still hasn't confirmed any specific details about the accident. The crew has since moved on to other projects after production was postponed indefinitely, but now schedules are starting to come together, with filming now slated to begin this coming February in a new location. If Maze Runner 3 would have kept its February 17, 2017 release date, it would have faced plenty of stiff competition. The movie was slated to go up against Sony's long-awaited adaptation of The Dark Tower, the Warner Bros.' comedy Fist Fight, starring Ice Cube and Charlie Day and Universal's The Great Wall starring Matt Damon. Wes Ball, who directed 2014's The Maze Runner and last year's The Maze Runner: The Scorch Trials, is directing from a script by T.S. Nowlin. 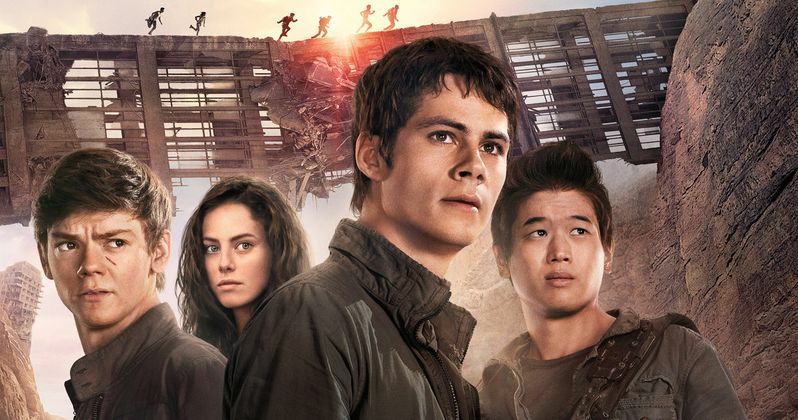 2014's The Maze Runner earned $340.7 million worldwide from just a $34 million production budget, with last year's sequel The Maze Runner: The Scorch Trials, earning $312.2 million from a $61 million budget. It isn't known how much shooting is left when principal photography resumes early next year, but we'll keep you posted with more updates on The Maze Runner: The Death Cure as soon as they surface.